In the past few days, heavy rain and strong winds have caused massive floods in more than 25 of Iran’s 31 provinces and many cities including Shiraz, Khorramabad and Isfahan. The massive floods have destroyed cities, homes, roads and have taken the lives of many people. While heavy floods have devastated most of Iran’s southern and western provinces, the authorities and Rouhani’s government are neglecting the victims and instead put the blame on one another. The people cannot hold back their anger at the lack of relief and the role of the authorities in destroying the country’s infrastructure, which have greatly contributed to worsening consequences of this natural disaster. Amid the disastrous floods and vast devastation, there is not much presence of aid workers and relief agencies. The regime has instead dispatched the Revolutionary Guard Corps (IRGC) and the Bassij paramilitary force to quell the outbreak of popular protests. The regime has also brought tanks and armoured vehicles in several cities to confront these protests. 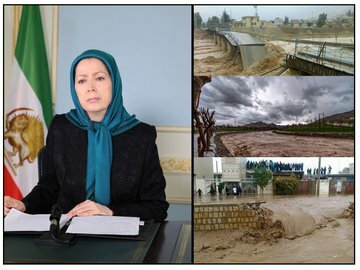 In a message of solidarity with flood victims, the President-elect of the National Council of Resistance of Iran (NCRI), Mrs Maryam Rajavi, called for “national solidarity versus the devastating floods and the ominous torrent of the clerical regime”. “This disaster once again proved that the ruling mullahs’ 40-year policy of plunder and pillage has taken a heavy toll on the lives and livelihood of our people in every flood and earthquake … Indeed, the clerical regime is truly an occupier regime”, the NCRI President-elect said. “The clerical regime hides the real statistics out of fear from people’s anger. This is while the number of flood victims in various cities in the country reaches over 200, with a majority in Shiraz. 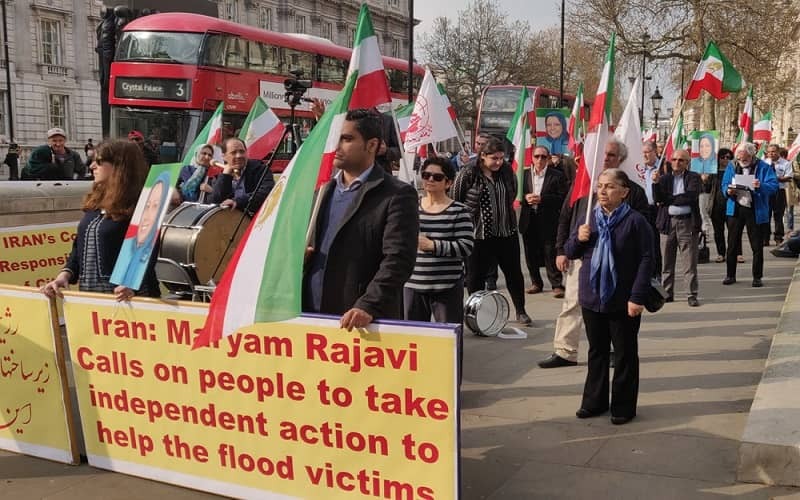 The delay and procrastination of the regime in helping and rescuing those who are besieged by the flood has increased the number of victims”, Hossein Abedini from the NCRI Foreign Affairs Committee said in his remarks to the rally reiterating that Mrs Rajavi’s call for national solidarity versus the devastating floods and the ominous torrent of the clerical regime is the best and only way for the people of Iran to help one another. Members of the Anglo-Iranian Communities supported the popular protests against the regime for not providing relief and condemned its repressive measures to crush the popular protests. In their remarks, representatives of Anglo-Iranian Associations called on the UK government to condemn the regime’s repressive response to the popular protests and urge the UK government to work with the EU to publicly call on the Iranian authorities to provide relief to the affected areas. Renowned Iranian artist and singer Gissoo Shakeri performed at the rally in solidarity with the flood victims and their families. In her remarks, she condemned the regime in Iran for only bringing destruction and misery to Iran with 40 years of repression. “The neglect and deceptions of the Iranian regime over the catastrophic floods and landslides are characteristic of its disregard and oppression of all dissidents. Mrs May’s Government must now take them to task”, Malcolm Fowler, Senior Solicitor and former member of the Human Rights Committee of the Law Society of England and Wales, said in his remarks to the rally.